Homeschooling moms, sometimes we just need a little pick-me-up. I’ve been homeschooling for more than 20 years and will be homeschooling for the next 18 years! I love being there for my kids and facilitating their learning process, but sometimes I can get a bit frazzled. If you know a homeschooling mom, here’s one thing you can do to make her week … send her a care package! I asked on Facebook what would you include in a gift basket to a homeschooling mom, and here are some of your great ideas. What would you include in a care package (or want included)? Share in the comment section for the chance to win a surprise set of books, a great start to a care package! 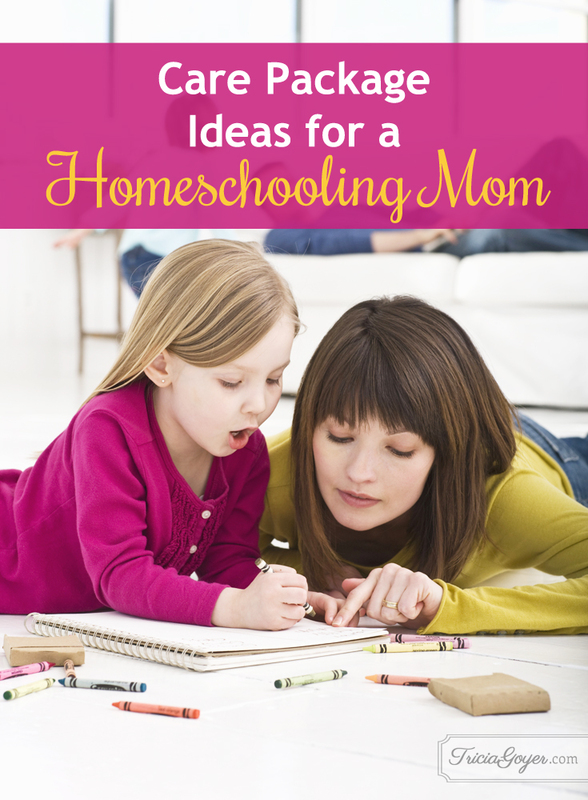 For more homeschooling posts, check out my How to … Homeschool page. A cd with uplifting music, gift card for local pizza place so she doesn’t have to make dinner, and luxurious hand lotion because even the simple things can give us a pick me up. Taking the kiddos on a field trip so that I can enjoy some time at home by myself or getting a gift card for coffee and dessert at my closest Starbucks (also to enjoy by myself). All of these ideas are good though. Thanks for the giveaway Tricia! Dark chocolate and tea in a pretty mug, post-its and pretty pens, and an Amazon gift card. Great list!! Another thing that I would love in a homeschool mom care package is a voucher for some teaching sessions. If someone would teach my kids school one morning, it would make my week! a gift card for a massage or mani/pedi, a good book, and their drink of choice. Definitely Amazon and Starbucks giftcards! A couple from Idaho recently moved next to us and she is homeschooling their two children. I took her to the library where I worked for 22 1/2 years and introduced her to the staff and showed her some of the collections that would help her with her lesson plans. I also showed her our historical society and other places of interest. I think this helped her as she was planning to include a class on Kentucky history in their studies. I also offered to be there for them if she should need to be away. Mug, teas, bath items with a beautiful candle, a book I know would inspire her, coupons I would make to offer to keep the kids for her and several frozen meals she could pop in the oven or crock pot. Some nice bath salts or bubble bath and scented candle and a certificate or two for babysitting her kids. i would include a couple of freezer meals for those nights she doesn’t want to cook? Hey my suggestion got put up there 😉 I still agree with my idea: a list of my favorite homeschooling blogs and a cute devotional journal. It would be nice to include a gift card to a local take-out place (along with the menu!) and/or a frozen, home-cooked meal. We will be doing a second year of homeschooling with our daughter next year. While I am a newbie at it I have seen a real improvement all the way around with her schooling and attitude. I would love to have a blog list of encouraging poems and quotes. Some time to myself to read and relax and lots of tea for sure. I would love to win a book package since I can’t afford to buy books it would be a real blessing. Thank you for the opportunity ! I jokingly asked my son if he had a gift for his teacher this year (me). He gave me the globe he made in social studies today and I laughed. He said the real gift was that he makes me laugh. . .probably true. 🙂 but a surprise box of books would be fun too! My daughter-in-law is homeschooling my grandchildren, I would say that she would need things to keep her calm and to please an eager 10 year old that loves to read and is very smart and a lovely 4 year old who loves to follow her big brother around and take mommies phone and computer to play with. Two very active children living the military life and being home schooled. Love this idea, I have a lot of friends who homeschool can’t believe I have never thought of this. I think a mug with a gift certificate for coffee along with the journal is such a sweet idea! When I was homeschooling a tiny break in the form of a babysitter would have been great. I am also a huge fan of anything organization. So would have geeked out if someone gave me markers, a binder, etc. to organize my lesson plans. Great ideas! I would also add chocolate!! Because, why not?! I love all these ideas! When I homeschooled my children we took breaks together. Maybe to the local park, museum, art gallery, mall; I tried my best to enjoy my children. They are only ours for a little while! Line up a time I can treat her out to lunch when the dad’s can keep the kids! I know you can’t put these in a box, but If I could, I would give any homeschool mom a mentor and a great library with helpful staff. Oh, and a great homeschool group is good too! If it has to be something that wil fit in a box, I’d say lots of dry erase markers and gift cards for Amazon.com. Even from an empty-nester, I enjoy your advice to young moms. Wish I had this when mine were little. Oooooh, I love the concept! This will be my first year homeschooling but I’m sure things like a journal, movie like Moms Night Out, pens (who doesn’t love pens?? ), some comfy socks (not sure why, just makes sense in my head), a Starbucks gift card to relax or to do lesson planning would be an awesome start for ideas! A journal with a pen, a starbucks giftcard, and a chocolate bar. Relaxing music (Baroque, perhaps) CD, chocolate, tea, a heatable neck pillow (maybe with some lavender in it), a fun movie, and a good (Tricia Goyer) book! This would be a great gift for my sister who will begin homeschooling for the first time in the fall!! And I would include tickets or coupons or something for a trip to the museum or zoo or something! I would love to have a care package that gives you ideas for field trips for teenagers, a box of chocolates, hot chocolate ,a mug and Anazin gift card to help my book addiction. Oops I am sorry for the misspelling. It should say Amazon gift card for my book addiction. Homeschool a teenage son is challenging so maybe I should add a spa day. I would like a gift card to a quiet restaurant & a book and/or a gift card to take the family out on a night that I was too tired to cook. Thank you for the opportunity to win. Great list … I would add, if you know this mom very well, do something for her you know she would truly appreciate. For example, offer to watch her kids for a couple of hours so she can have alone time, or maybe have a date with hubby. Or offer to take her kids to the park so she can rest or tidy up unhindered. Or maybe take her out for lunch or dinner while her hubby takes charge of the kids for a few hours. It sounds so “small”, but it’s truly a big deal. We all love our children, but yes, we all need the occasional break. A gift card for CBD ! Tea. And a lovely journal. Lindor truffles, Amazon or CBD giftcard, a devotional, lots of bookmarks, and a quality pencil sharpener. i would include a gift certificate for school supplies, a meal, and sometime away without the kids. While she is gone I would clean the house and do the laundry. For me it really is all about time. Finding time to pamper myself as a homeschooling mother always gets put on the bottom of the list. I know love yourself first before you can love others but it doesn’t always happen. Inevitably I put myself on the back burner till I get really sick or stressed and then i have to make time. So I would give time, with the kids, teaching, playing, exploring, cleaning, crafting, anything to give the parents a few minutes to themselves without worry of coming home to a messy house. A gift certificate for a massage! I have found that anything at all is encouraging: a note in the mail or email, bringing over or ordering dinner to be delivered, an invitation to go out for coffee or a meal without the children, maybe an offer to babysit while the mom goes out with her husband. But if limited to just a gift basket, the list is endless: coffee, cinnamon and/or coffee syrups, gift cards, chocolate, candles, books, homeschooling supplies, jewelry, trinkets, music, homemade goodies, event tickets, etc. I love this idea, I will tell my wife about this cool idea. 🙂 Thanks so much.